“I’m backing the Dalton BID because if the businesses on Dalton Industrial Estate and Dalton Lane are to proposer it is important that we remove the damaging imposition that flooding imposes on access and egress from the A167/A168. The Dalton BID will be a business-led, independent not-for-profit company run for the benefit of businesses and with the sole objective to resolve the current flooding problems. Through the BID development work so far undertaken we now have local businesses working together, this can only be a good thing. Our BID will help to attract new companies and employees to come to the area and will improve the industrial area for established businesses. The Dalton Industrial Estate Steering Group proposes to establish a Business Improvement District for Dalton Industrial Estate. Hambleton District Council is the Local Authority and the billing authority for National Non-Domestic Rates for the Dalton Industrial Estates Area. If the Dalton Industrial Estate BID is approved then the Bid will start on the 1 August 2016. 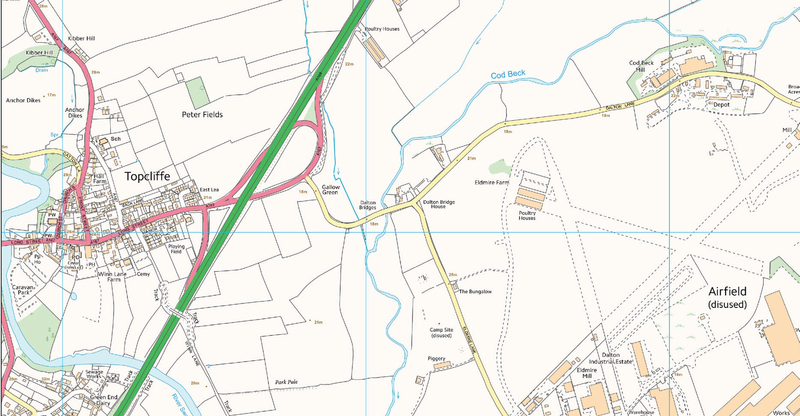 The Dalton Industrial Estate Business Improvement District is being established for the sole purpose of constructing a new bridge and highway across Cod Beck to lift the highway network out of the flood plain to secure access and egress from the estate during periods of heavy rain. 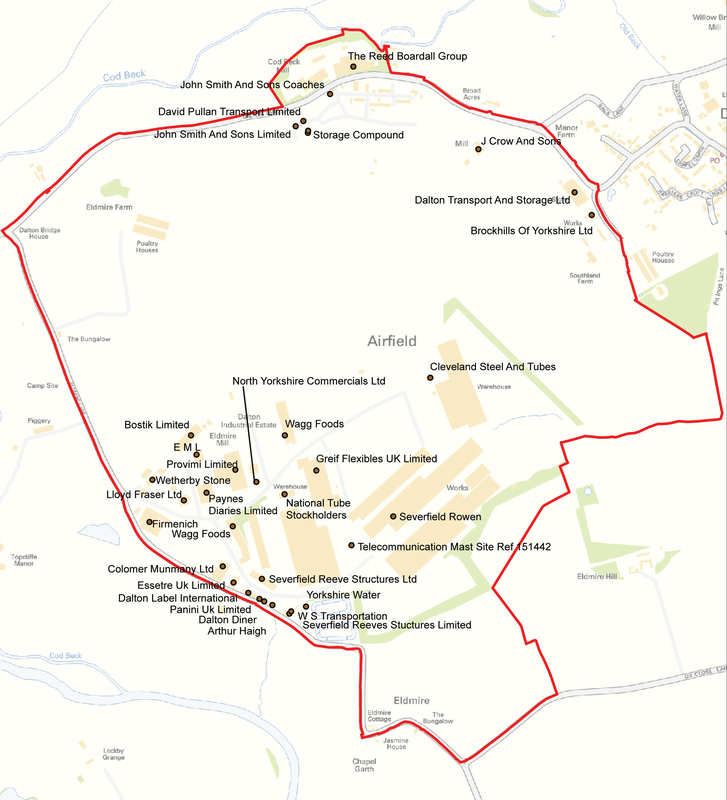 The geographical boundary for the Dalton Industrial Estate Business Improvement District is as shown on the plan below. Predominantly the area is the site of the old Dalton Airfield, now the Dalton Industrial Estate, bounded by Dalton lane to the north and Eldmire Lane to the west. The boundary also includes business along Dalton Lane who would gain a direct benefit from an elevated bridge and highways access. The Dalton BID Company will be accountable for the delivery of the BID and accountable to you. The Dalton Industrial Estate Steering Group is currently responsible for agreeing the content of the BID Business Plan, with input from local businesses. It will remain in place until a successful “Yes” vote is achieved. Following a successful BID ballot, A BID Company and new BID Board of Directors will be established. The current BID Steering Group provides a balanced representation of businesses in the industrial area and meets on a monthly basis. The new BID Board will aim to offer a similar balanced representation for the area. It will also meet regularly, and invite businesses from across the industrial area to take part in meetings, all businesses will also be invited to the annual AGM. A new constitution will be created which will outline how people are appointed to the BID Board, how the Chairman is elected and when and how people are asked to step down, in order to allow all businesses to take an active role. The Dalton Industrial Estate company will be incorporated as a private company limited by shares. The BID Company will be overseen by a Board of Directors, which is open to any Dalton business to join, whom will be responsible for ensuring the Dalton Bridge and Highway project, as set out in the BID Business Plan, is delivered. The BID Board will be responsible for directing the delivery of the project, ensuring value for money of levy payers. Subject to the articles and to the applicable provisions of the Companies Act, the directors will be responsible for the management of the company’s business, for which purpose they may exercise all the powers of the company. Appointment of shareholders and directors will be in accordance with the Articles of Association and Shareholders Agreement. The Dalton Industrial Estate Company will be responsible for delivery of all objectives set out in this business plan. The new BID Board will meet regularly, and invite businesses from within the BID geographical boundary to take part in meetings, all businesses will also be invited to the annual AGM. You will have received ballot papers.